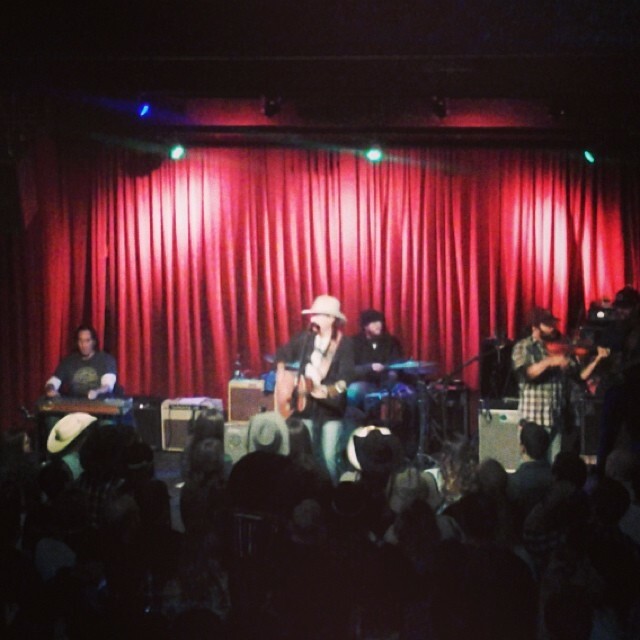 A near sold out crowd greeted Jason Boland & The Stragglers and openers Thieving Birds on an icy Friday night in Saint Louis. The house was packed, the beer line was long, and the cowboy hats were at a record high for downtown STL. Mixing favorites from their first album (“Save My Soul” and “Memphis”) along with fiery versions of Gold Coast standouts “Graveyard Love,” “Black Canyon Boom,” and “In Your Arms,” Thieving Birds really showed what they were capable of on the last night of their run of shows opening for Boland. Although contained to a meager 45 minutes, this was a very impressive set. These guys deserve some support. Jason Boland & The Stragglers came on next, while I was still outside near the fire pit interviewing Ace and Beau from Thieving Birds. From outside the venue, I could hear Boland’s truly remarkable baritone vocals booming out of the speakers, along with a hundred plus fans singing along with every word. Three songs into the setlist, Boland played two of my favorite songs back to back: the Southern rock jam “Pushing Luck” and the Pearl Snaps classic “Somewhere Down in Texas.” The latter of these was received by a huge amount of enthusiasm. Despite the urban Midwest locale and the dangerous road conditions, a packed house witnessed Thieving Birds and Jason Boland & The Stragglers play their asses off. Rock on. In between sets, I had the privilege to ask the Ace (lead vocals/guitar) and Beau (drums) of Thieving Birds a few questions. Note: I used the simple tag “Thieving Birds” to represent the answers that Ace and Beau gave. Dallas Terry: How’s the reception been at the shows since the release of your newest album? Thieving Birds: It’s been great considering the fact that we play little bit more rock than most people would like. DT: Yeah that’s interesting that your band tours with bands like Jason Boland & The Stragglers. How do you feel about being involved in this scene? Thieving Birds: Well it’s a very welcoming scene. The people like good music and they come out to the shows. Plus there’s a lot of camaraderie between bands. The rock scene is much more cut-throat. We were involved in the rock scene for about ten years and it’s way more competitive than this scene. In this scene everyone just kind of helps each other out. DT: How do you feel about the decision to switch scenes from rock to this one? Thieving Birds: It was a great decision. DT: Any new plans with the band? DT: If you could only play one venue for the rest of your life, what would it be? Thieving Birds: The Blue Light Live in Lubbock. DT: If you could only take three albums with you to a desert island, what would they be? I simply want to tell you that I’m newbie to blogging and site-building and honestly loved this blog site. Almost certainly I’m planning to bookmark your blog post . You amazingly come with wonderful well written articles. Cheers for sharing your blog site. Needed to send you the tiny word to be able to say thank you once again with your unique tips you’ve provided in this article. This has been quite remarkably generous with people like you to give openly just what a lot of folks could have supplied for an e book to generate some dough on their own, primarily considering the fact that you might well have tried it in the event you desired. Those strategies in addition served to become a easy way to be sure that some people have the same desire really like my personal own to learn a great deal more on the topic of this matter. I’m sure there are some more enjoyable instances in the future for people who take a look at your blog post. hey there and thank you for your info – I’ve definitely picked up anything new from right here. I did however expertise several technical issues using this web site, as I experienced to reload the web site many times previous to I could get it to load properly. I had been wondering if your web host is OK? Not that I’m complaining, but sluggish loading instances times will often affect your placement in google and could damage your high quality score if advertising and marketing with Adwords. Anyway I am adding this RSS to my email and could look out for much more of your respective interesting content. Make sure you update this again very soon..
Just wish to say your article is as astounding. The clarity in your post is simply great and i can assume you’re an expert on this subject. Well with your permission allow me to grab your feed to keep up to date with forthcoming post. Thanks a million and please keep up the enjoyable work. I just wanted to make a small note to thank you for all of the precious tips you are giving on this website. My prolonged internet look up has at the end been paid with reliable insight to share with my close friends. I ‘d repeat that we readers actually are undoubtedly lucky to exist in a superb site with many awesome people with very beneficial basics. I feel rather lucky to have come across your entire webpage and look forward to many more enjoyable minutes reading here. Thanks a lot once more for a lot of things. Thanks for every other fantastic post. The place else may just anybody get that type of information in such a perfect means of writing? I’ve a presentation subsequent week, and I am on the look for such info. I would like to show thanks to the writer for bailing me out of this type of difficulty. Just after looking throughout the search engines and seeing recommendations which are not pleasant, I believed my entire life was done. Living without the presence of solutions to the difficulties you’ve resolved by way of your main guide is a crucial case, as well as ones that would have in a wrong way damaged my entire career if I had not discovered your web blog. The talents and kindness in playing with a lot of stuff was very helpful. I don’t know what I would have done if I hadn’t come across such a subject like this. I am able to at this time look forward to my future. Thanks very much for your skilled and effective help. I will not think twice to refer your web sites to any person who should get guidelines on this matter.